What do city workers need more of in Adelaide? The beach. That would be the answer international artist, Andrew Baines, would give to that question as he joins us tonight to discuss art, Adelaide and the raising of daughters. 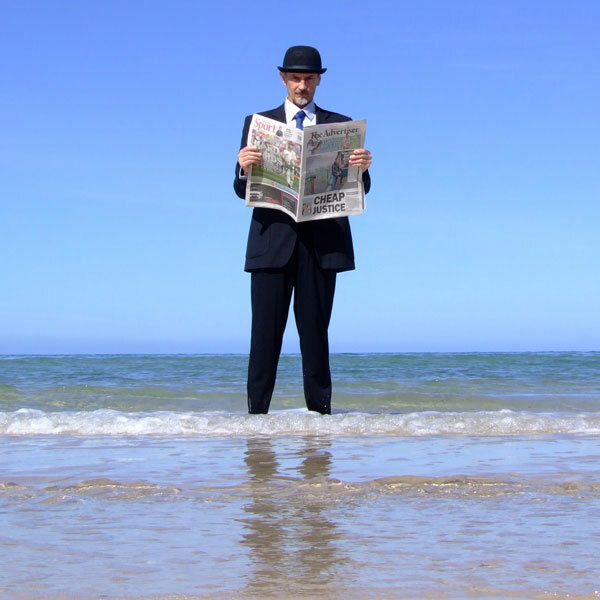 Andrew has made a splash with his surrealist art, placing office workers, symphony orchestra members and even Bob Francis in vulnerable positions at the seaside. Brett Monten has returned from a 3 week tour of China with his Adelaide band, Plan B, and he shares his insights of that huge nation. In Is It News, the question is, can Brett reclaim his tiara against Steve as they try to guess which one of Susan’s headlines is actual news. In the Adelaide Visa Council we document and reward a Road To Damascus conversion for a visitor to Adelaide, we hear a brand new song from Adelaide band, Colibrium, and we reveal which commercial Australian radio station has placed our very own Susan Lily on their playlist. 00:02:36 South Australian Drink Of The Week Maglieri 2012 McLaren Vale Shiraz. Tasting notes. If you’ve seen colourful sheep in Victoria Square recently, or symphony orchestra members playing instruments while standing in the sea, then you’ve seen our next guest at work. Andrew Baines is an internationally acclaimed artist who creates quite spellbinding surrealist paintings and photography. He’s been a finalist in more than 20 art prizes, including the Doug Moran National Portrait prize, and is even included in the European encyclopaedia of surrealism “Lexikon der Surrealisten” and A Portuguese book on Surrealism “International Surrealism Now”. Susan: Daisy Jane. Hear it in episode 56. 00:53:00 Musical Pilgrimage And our music tonight is from Colibrium with What do we have left?